​Arsenal star Mesut Ozil once again showcased his love for India, especially Bollywood yesterday by meeting with superstar Shah Rukh Khan, who was at the Emirates stadium to watch Arsenal’s clash against Newcastle United. He captioned this post as, "It was a big honour to have you as my special guest during yesterday's match! ⚽ Thanks for coming! @iamsrk || Kal ki match mein aapka swaagat karna mere liye ek sammaan ki baat thi. ⚽ Aane ke liye dhanyavaad. 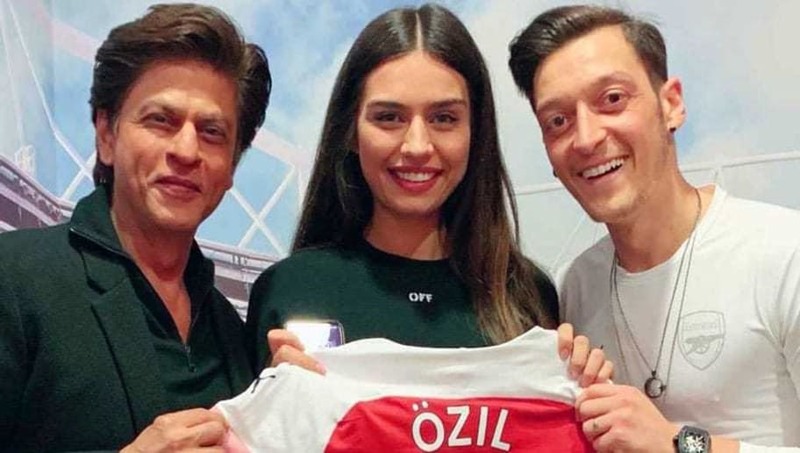 #M1Ö"
Another Bollywood favourite and an Arsenal fan, Ranveer Singh was quick to comment on Ozil's Instagram pic with Shahrukh. Singh commented "Kya baat hai, Bhai!" to which Ozil replied in typical Gully Boy slang, "Bohot hard, Bhai!" Ranveer, however, wasn't done yet as he replied again and said, "EK NUMBER, LALA @M10_official". Well, we have to say that Ozil's strong social media game is definitely pleasing Indian audiences.